Interested in learning about Hispanic traditions? Great! You've come to the right place. But before we get into the details of some of the most popular Latino traditions lets define the term "tradition". The transmission of beliefs, celebrations, customs, ideas, information, legends, practices, stories, etc., from one generation to another. Many traditions are passed down in oral form. An established order or method of how to do certain things. An accepted manner of behavior, which may include both religious and secular practices and beliefs. A piñata is a brightly-colored party ornament made from either a clay container or cardboard (usually embellished with papier-mâché). 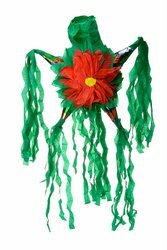 If made of cardboard, the piñata can be of any shape, including geometric forms, superheroes, flowers, and animals – among many others. Many experts believe that the piñata originated in Mexico. Archeological evidence shows that the Aztecs, Mayans and other native people had their own versions of the piñata. These early piñatas were pots made of clay which were broken (usually using sticks) to reveal its contents. Such items represented gifts from the gods. The piñata tradition is very popular in Central America and other Latin American countries, including Colombia, Ecuador, Peru, Puerto Rico, and Venezuela. This tradition has also spread to the United States. As a child in Central America, the "piñata ritual" went like this: a child would be selected to hit the piñata. He or she would then be blindfolded. With a stick or club, the child would attempt to break the piñata. Needless to say, some children (and adults) would end up being hit on the head. That wasn’t a pretty sight, let me tell you. Nowadays, the piñata is not broken. Instead, it is gently opened by pulling the strings attached to it. This is way safer than the older tradition. In my country, piñatas were used mainly to celebrate birthdays. But they were also broken during First Communions, Baptisms and other celebrations. The piñata remains a very popular and festive Hispanic tradition. The Quince Años celebration - also known as Fiesta Quinceañera, Quinces or Fiesta Rosa – is a very popular tradition is most Latin American countries. The Fiesta Quinceanera marks the right of passage from girlhood to young womanhood. Each country and/or community has a slight variation of the celebration, but it generally consists of a big party with the Quinceañera as the focus of the event. For this special day, the girl wears a very elaborate dress, usually in a pastel color. Most parties also include a waltz, which the girl dances with her father, older brother or other male relative. 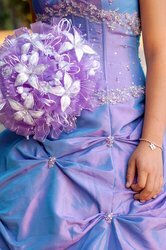 Nowadays, many girls do opt for a less formal party and some even take a trip with family and/or friends as an alternative to the traditional "quince". This is a traditional Mexican birthday song (some people say that in fact, it is two songs in one). The tradition has spread to different Latin American countries, particularly in Central America where it has become widely popular. The song is usually sung in the morning and sometimes as a serenade (serenata). Get up in the morning, look it is already dawn. Las Mananitas - Find here the complete lyrics to this popular birthday song. Also find here background information and videos. El Día de los Muertos (also known as Día de los Difuntos or Día de Finados ) is widely celebrated in most Latin American countries. This tradition is observed on November 2nd (All Souls’ Day according to the Catholic calendar). In Mexico and other countries November 1st is dedicated to honoring and remembering babies and children who have passed on. The date coincides with All Saints’ Day, which is celebrated by Catholics around the world. During the Day of the Dead, people remember family members and friends who have passed away. In Mexico, people erect "altares" (altars) in honor of the departed. 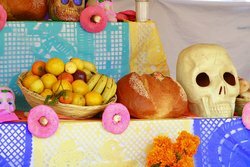 These altars can be decorated with flowers, pictures of the deceased, fruits and other foodstuffs. Indeed, some of these altars can be quite elaborate (see picture above). On this day, people also go to the cemetery to "enflorar" (place flowers on the graves of family members and friends) and many spend the day there. Even though this day revolves around death, it is a very festive tradition which focuses on celebrating the life of those who have crossed to the other side. Las posadas and las pastorelas – Posadas are re-enactments of the time when Mary and Joseph were looking for a place to stay before Jesus was born. Las pastorelas are plays that retell the story of Christmas. These two Hispanic traditions are particularly popular in Mexico. La cena de nochebuena (Christmas Eve’s family dinner) – A very special night celebrated with family and close friends. Food plays an important role during this celebration and each country has its own special dish. La misa de gallo (Midnight Mass) – This special mass is celebrated at the stroke of midnight and it commemorates the birth of Jesus Christ. La quema de polvora y luces de navidad (fireworks and sparklers) – Fireworks of every kind are very popular during this time of year. Los farolitos y luminarias (festive lanterns) – Many communities celebrate the Day of the Immaculate Conception by lighting candles and lanterns. In some countries this special celebration takes place on December 7th. It is also known as El Dia de las Luces (Day of the Lights). Los villancicos de navidad (Christmas carols) – Different countries have special folk songs to celebrate Christmas. In Puerto Rico such Christmas songs are called "aguinaldos". La carta al niño Dios (Christmas letter to Baby Jesus) – Latino children write letters to el niño instead of Santa Claus, even though Santa Claus is growing more and more popular with each generation. El nacimiento (The Nativity Scene) – The nativity scene plays a prominent role during Christmas. It is usually placed below the Christmas tree and it can get quite elaborate. Los reyes magos (The Three Kings) – Even though the day of the Three Kings falls in January, they are important players during Christmas celebrations. 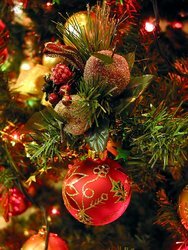 Decorar con pascuas (decorate with poinsettia flowers) – Natural and artificial poinsettias add the Christmas touch (toque navideño) to homes and offices. I hope you enjoyed reading about these Latin traditions. And even though this is just a small sample, I hope they give you a glimpse into the richness of the Hispanic culture. I'll add new Hispanic traditions and updates regularly, so check back often. Hispanic Holidays - A comprehensive list of Hispanic special celebrations and observances.